The OGMA Race Night drew a good gathering of 55 members to enjoy some standardbred horse racing and a delicious meal at Woodbine Racetrack in Toronto on April 12. A prominent developer is installing protective mesh on balconies of some of its downtown condominium buildings over concerns of deficient glass. 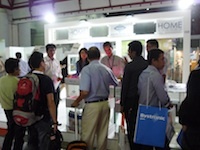 Glasstech Asia 2012 will be held in Thailand from 18 to 20 July 2012 at Bangkok International Trade & Exhibition Centre (BITEC). The show coincides with the Thai government’s aim of jump-starting the Thai economy after the subsiding of the flood situation. 4,500 trade professionals are expected to visit the three-day event, which has a total of six country pavilions: China, Germany, Singapore, Taiwan, Thailand and the United Kingdom. Some 380 companies from 45 countries are also expected to take part in the show with a gross area of 8,000 square metres. For more information click: Learn more. Kawneer Company has announced that Bob Leyland, director of sales, has elected to retire on Aug. 3 after 37 years with the company. Colin Brosmer, currently director of front-end services, will assume the role of director of sales effective July 27. In the 2012 CGA Directory mailed with April Glass Canada, the phone numbers for members of the Provincial Glaziers Association of Alberta are incorrect. The other company information provided is correct. We will soon be providing a downloadable document with the corrected listings for the PGAA, and printing them in the June issue of Glass Canada. Glass Canada regrets the error. Glass Canada exclusive! John Grilli of Door Com walks us through his new product lines from Imperial.